New York Times bestselling writer Joe Hill and artist Gabriel Rodriguez, the creators behind the acclaimed Locke & Key: Welcome to Lovecraft, return with the next chapter in the ongoing tale, Head Games. Following a shocking death that dredges up memories of their father's murder, Kinsey and Tyler Locke are thrown into choppy emotional waters, and turn to their new friend, Zack Wells, for support, little suspecting Zack's dark secret. Meanwhile, six-year-old Bode Locke tries to puzzle out the secret of the head key, and Uncle Duncan is jarred into the past by a disturbingly familiar face. Open your mind - the head games are just getting started. Since reading Welcome to Lovecraft, I haven't been able to stop thinking about this world. The artwork is amazing, and the storyline is dark, creepy, and totally captivating. 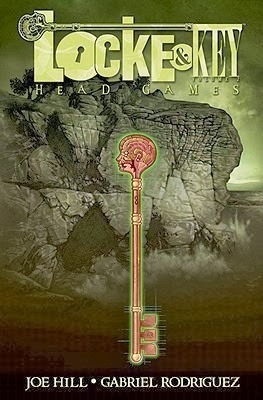 I had to order Head Games as soon as pay day arrived, because I simply couldn't wait any longer. The wait for it was awful, but I finally got my hands on it and I loved it! Locke & Key is a fantastic series, and I am so happy that the second graphic novel lived up - even surpassed! - my expectations. Dodge has become one of my favourite characters. In Head Games, we get a bit more insight into his background. We see what his connection is with the Locke family, and with Ellie, but at the same time Dodge remains very mysterious. I'm very intrigued by him, and he is my favourite character of the Locke & Key series because a) he is creepy and vile and a good villain, and b) he is so damn interesting. I love a good backstory for a villain, and often they are underdeveloped in favour of the heroes of the story. But Dodge's story is great so far, and I can't wait to see more of him. Due to the focus on Dodge and Ellie, Head Games spends a little less time on the Locke family than Welcome to Lovecraft did. Kinsey was the most heavily featured family member in this instalment, and I really enjoyed that. You get to see how she is handling - or, rather, not handling - the tragedy that caused her to move to Lovecraft in the first place, and you also see her start to form ties with other characters. I like that she is not immune to the crap that happened to her, and the stuff that is still going on in her life. I also loved the storyline of how she was trying to change herself. At this point in time she feels weak and vulnerable, and it willing to take somewhat drastic measures to change that. I can't wait to see her development in the rest of the books, because I think she's going to be a great character. I'm looking forward to seeing more of the Locke family in the next book, because I have heard that they are the main focus of that one. Head Games is filled with excellent suspense. I couldn't stop reading, but at the same time I was afraid to turn the page. That's the mark of a good horror story, in my opinion! It's all very mysterious at this point, and I love how Joe Hill reveals small things, and then opens up a whole bunch of other questions. Some things that I'm excited to find out are: What's up with the cave? WTF happened to Dodge? Why are teenagers so stupid? Once again, this instalment had a gallery at the back of the book, filled with great drawings and artwork from Rodriguez. I keep going back to flick through it, because some of the stuff in there is kind of breathtaking. I'm so glad that this series continues to be amazing. I have formed a real connection with some of the characters, and I can't wait for more! I'm impatiently waiting for my copy of Crown of Shadows to arrive so I can devour it. I'd definitely recommend this series to fans of horror and mystery. It's all a lot of fun, if you can handle the dark themes.